Be the first to share your favorite memory, photo or story of Juliette. This memorial page is dedicated for family, friends and future generations to celebrate the life of their loved one. Born on April 3rd, 1924 in Ramadi, Iraq, Juliette was the second of eight children. She grew up in Baghdad and attended Catholic boarding school in Lebanon where she became fluent in Arabic, French and English. In her early twenties, she was introduced to Sami Murad who was visiting family in Baghdad after completing university studies and serving in WWII for the U.S. army. With their families’ approval, the couple were married in a private ceremony and Juliette moved to New York City with Sami in 1947 where they had a second ceremony at City Hall. In 1949 Sami and Juliette moved to Detroit, Michigan where they raised their five children—Peter, Paul, Pamela, Patrick and Timothy. The family was active in the Chaldean community of metro Detroit, while also establishing deep roots in their new country. JouJou and Sami were constantly welcoming multiple family members to live with them until they got settled in the new world. Her faith was a constant in her life and she regularly attended Catholic mass and showed compassion for those in need. Although she carried a tough exterior, JouJou always welcomed others into her home where she fed them, taught them to cook and appreciate traditional Iraqi dishes as well as her own interpretations of American classics, including fried chicken and her famous cheesecake. Showing her love through food, you’d always leave her house with a full stomach and enough produce from her garden to last you for weeks. Juliette’s family has always been humored by her passion for gambling and her passionate dislike of garlic. Family was always at the center of her life, as she was the center of theirs. In the days before her passing, Juliette was visited by over two dozen family members and friends coming to pay their respects and to honor her life. The matriarch to many, she is loved and will be missed deeply. She is survived by her children, Peter (Kristina) Murad, Paul (Maureen) Murad, Pamela (Robert) Long, Patrick Murad (Tina Zinn) and Timothy Murad; grandchildren, Noelle Sharrak, Andrea Murad, Angela De La Rosa, Elizabeth Murad-Patel, Kelly Celic, Colin Murad, Elle Murad, Sofia Murad, Nicholas Long and Sami Murad; 10 great-grandchildren; and siblings, Nanette (Jack) Kilano, Henry (Najla) Abbosh, Jules (Norma) Abbosh, Rudy (Kathy) Abbosh and Vera (Ben) Ossi, as well as many close friends and extended family members. Juliette was preceded in death by her loving husband, Sami P. Murad (d. 1993); sister, Henriette (Hikmat) Abbosh and sister, Germaine (Satar) Abbosh. Friends and family may gather at Lynch & Sons Funeral Home, 404 E. Liberty St. on Monday, April 15, 2019 from 3:00PM – 8:00PM. Rosary at 7:00PM. A Funeral Mass will be held from Church of the Holy Spirit, 3700 Harvey Lake Rd., Highland, on Tuesday, April 16, 2019 at 10:00AM with gathering beginning at 9:00AM. Father Wayne Ureel to officiate. Because Juliette was sympathetic to her family left behind in Iraq, all donations will be sent to those relatives who are still making their way as refugees. 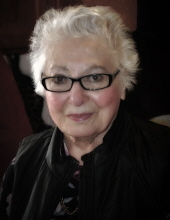 "Email Address" would like to share the life celebration of Juliette A. Murad. Click on the "link" to go to share a favorite memory or leave a condolence message for the family.